Consider America. Having arrived in numbers from the 1960s onwards, Gujaratis now run about a third of all its hotels and motels. Furthermore, this was achieved mostly by just one group, essentially an extended family, the Patels, who hail originally from a string of villages between the industrial cities of Baroda (or Vadodara) and Surat (see map). Like other South Asians, they highly value degrees in medicine and engineering. But they have the added knack of turning a degree into a business opportunity. Thus they own almost half (12,000) of America’s independent pharmacies (as well as one of the biggest chains in Britain, Day Lewis). There are thousands of Gujarati doctors in America, and they are quicker than most to start up their own practices. Bhupendra Patel, for instance, studied medicine in Baroda before coming to America in 1971. He set up a practice four years later, bought his own building in Queens, a borough of New York City, in 1978 and soon had 30 or so doctors working for him. His classmates were certainly impressed; out of 120 of his peers, 90 came to America in his wake. These stories point to a couple of outstanding characteristics. Most fundamentally, those Gujaratis who turn to business say that they are constitutionally unsuited to working for other people. For them, the best way to work for yourself is to run your own business, “to take your destiny in your hands”, as Russell Mehta, the head of Rosy Blue, a large diamond processor, puts it. For these people, enterprise is virtually a cultural obligation, and has always earned the most respect. Starting a small corner-shop is seen as more impressive than holding a mid-level management job in somebody else’s company. For many Gujaratis the point of acquiring knowledge is to attain practical goals, particularly business goals. The Gujarati word vediyo, meaning a person who studies the Vedas, the ancient Sanskrit texts that constitute the oldest scriptures of Hinduism, has come to mean a “learned fool”. Ethnic-Indian Americans have applied their practical knowledge to Silicon Valley; they are responsible for about a quarter of all startups there, and a quarter of those are thought to be Gujarati. Around the globe, they have come to wield huge influence in the diamond business. An impressive 90% of the world’s rough diamonds are cut and polished in the Gujarati city of Surat, a business worth about $13 billion a year, and Indians, predominantly Gujaratis, control almost three-quarters of Antwerp’s diamond industry. Like the motel owners, the great majority of diamond processors come from just one community, almost all of them tracing their origins back to one otherwise-obscure city in the north of Gujarat state called Palanpur. Unsurprisingly, given their success abroad, they have been at the forefront of India’s own recent economic surge, too. The three wealthiest Indian businesspeople—Mukesh Ambani, Dilip Shanghvi and Azim Premji—are Gujarati. With just 5% of India’s workforce, Gujarat produces 22% of the country’s exports. Reliance, one of India’s largest private conglomerates, is Gujarati-owned. The industrial centres of Ahmedabad and Surat dominate India’s synthetic textile sector. One of the world’s biggest denim factories is in Ahmedabad, which is also home to some of India’s pharmaceutical giants. All this has produced handsome revenues for the state’s coffers, and with it the sleek new roads that persuaded many Indians to vote for the former chief minister of Gujarat, Narendra Modi, as prime minister in 2014. As the state of Gujarat accounts for about a fifth of India’s coastline, perhaps it was inevitable that its peoples should be merchants and travellers. Its position also helped: it is well-situated for the Persian Gulf and Africa, and routes to South-East Asia. Gujarati traders have been recorded on the African and Gulf littorals since before the tenth century, and extensive trade with the Arabs partly accounts for the strong Islamic influence on the state, which was founded as a modern administrative unit in 1960. It consists of three main regions: the Kutch, a largely arid, sparsely populated area now abutting the border with Pakistan; Saurashtra, the westernmost point; and central Gujarat to the east, the main industrial belt. The graceful dhows that bore most of the Gujarati trade are still built by hand at Mandvi, on the coast of Kutch. Under the influence of Muslim traders, and Persians invading from the north, many Hindus were converted to Islam. They now constitute the Muslim sects of the Bohras, Khojas and Memons. This was an important part of the development of a commercial ethos in Gujarat, as after conversion to Islam these communities were relieved of the Hindu restriction on “crossing the sea”. It was not until 1905 that religious leaders lifted the social penalties against this among the two leading Hindu business organisations. One Hindu group, the Patidars, many of whom have the family name Patel, had mostly been farmers, but as family landholdings were subdivided among the sons, many were pushed into trading in agricultural products such as tobacco instead. As well as the accident of geography and the virtues of religion, other significant ingredients in the rise of Gujarati mercantilism were the institutions known as majahans, the equivalent of European guilds. These developed in the early Mughal period, in the 16th century, and they regulated trade and settled disputes within the various trading communities, such as the cloth or grain merchants. The mahajans provided a system of self-regulation, saysS. P. Hinduja, a professor of sociology at Delhi University, but they were also “multi-ethnic and multi-religious”, binding together the Muslims, Hindus, Jains and others into one commercial class. Whereas one religion, Protestantism, has often been associated with the rise of Anglo-Saxon capitalism, Gujarati capitalism was much more a fusion of influences. Ethnic and religious diversity became a source of strength, multiplying the trading networks that each community could exploit. Pragmatism and flexibility over identity, and a willingness to accommodate, perhaps inherited from the mahajans, are strong Gujarati traits, argues Edward Simpson of the School of Oriental and African Studies at the University of London. Gujaratis have been adept at remaining proudly Gujarati while becoming patriotically British, Ugandan or Fijian—an asset in a globalised economy. In the 10th and 11th centuries they developed a distinct code of ethics for doing business. Again, religion played a role, especially with the Jains. Jainism was originally a protest movement against Brahmanic traditions and the privileged classes within Hinduism, rather like the Protestant revolt within Christianity, says Mr Hinduja. Jains are pacifists and vegetarians. The injunction against harming any creature, especially insects, ruled out tilling the fields. In a largely agrarian society, that left few ways to earn a living other than trade or finance. Jain preachers drew up rules for business practice that emphasised non-violence and honesty. One such preacher, Hemchandracharya, determined that as peace was essential for trade, so merchants were at all times to avoid strife and provocation. Indeed, keeping a low profile has been another Gujarati characteristic. The region’s politicians, such as Mohandas (Mahatma) Gandhi, Muhammad Ali Jinnah—the founder of Pakistan—and Mr Modi, are renowned throughout the world, but its entrepreneurs often remain invisible, which is exactly the way they like it. Trust and honesty remain essential to Gujarati-dominated industries. Mr Mehta, himself a Jain from Palanpur, whose diamond company has a turnover of $1.8 billion and offices from Antwerp to Tokyo, says that, despite the size of the business, it is still “all based on handshakes and words, with no contracts”. In order to make the system work, he explains, diamond merchants prefer to deal with “the people they trust”—this usually means a group within the Gujaratis, in this case their fellow Jains from Palanpur. This is a big part of the reason why the subgroups of Gujaratis, such as the Patels and the Jains of Palanpur, have each congregated in one trade, and why most Gujarati businesses, except the very largest, remain run by families. 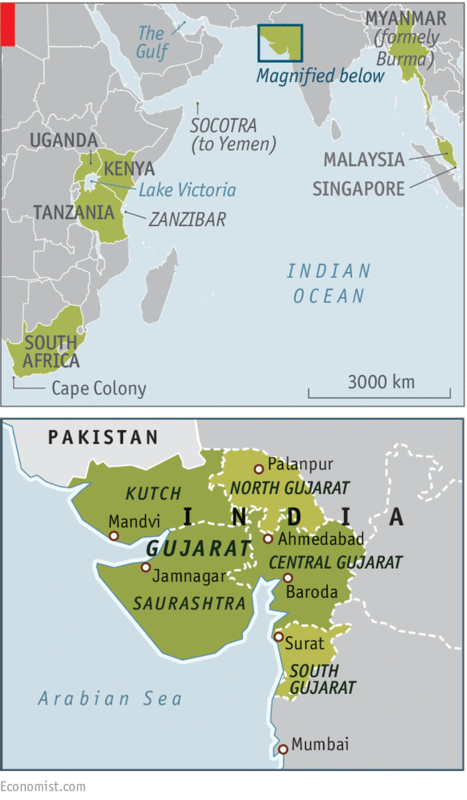 “Ethical business practices based on fair trade and honest dealings gave Gujarati traders a reputation of being trustworthy,” write Achyut Yagnik and Suchitra Sheth, two historians of the region. So when the Portuguese, Dutch and then the British started arriving in India from the 16th century they used Gujaratis as their principal trading partners. The headquarters of the British East India Company was originally at Surat. It was the Gujaratis’ relationships with the East India Company, and later the British crown, that were the biggest influences in shaping their contemporary trading empire. It was not only the trading opportunities that enticed Gujaratis abroad; most left their homeland out of desperation, to escape devastating famines, plague and cholera. But whereas other Indians arrived in the outposts of empire to labour on sugar plantations or build railways, Gujaratis such as Allidina Visram, the shopkeeper in east Africa, opened the stores that serviced the labourers. So commercially driven were the ethnic-Indian Ugandans, of whom about three-quarters were Gujarati, that at the peak of their success, in the mid-20th century, they contributed about a fifth of Uganda’s GDP despite numbering only about 100,000 out of a population of 8m. One of their number was the singer Freddie Mercury, born on Zanzibar in 1946. Gujaratis enjoyed similar success in other colonies of the British empire, notably Kenya and South Africa. Memons, in particular, prospered in Burma, trading mainly in teak, rice and tea. The most successful was the very wealthy Sir Abdul Karim Jamal, knighted by the British in 1920. Originally from Jamnagar in Kathiawar, the “King of Rice” even had a street named after him in Rangoon (now Yangon). Considering how well the Gujaratis did out of the empire, it seems only natural that a Jain from Palanpur, Sanjiv Mehta, should now own the East India Company itself. He snapped up the moribund company in 2005 and has opened a posh store bearing its name in London’s West End. It sells fine crockery, traditional marmalades and, inevitably, tea. To guilty Britons the company is redolent of imperial exploitation, but to Mr Mehta it is more of a brand “known all over the world, the Google of its age”. The world’s first joint-stock company has come round full circle. The intimate connection with the British, however, came at a price. The Gujaratis were identified as little more than colonial satraps by indigenous Burmans, Ugandans and others. So once the British left, they were often targeted by the first post-independence politicians, asserting their nationalist credentials. In Burma (now Myanmar), the military regime that took over in 1962 nationalised all foreign businesses, forcing hundreds of thousands of Indians out of the country. In Uganda, in 1972, the deranged dictator, Idi Amin, abruptly gave the country’s 60,000 South Asians, mostly Gujaratis, 90 days to leave. The consequence, as elsewhere, was precipitous economic collapse. Amin’s cronies sequestered the Gujaratis’ businesses and ran them into the ground. In 1997 a new Ugandan president, Yoweri Museveni, came to Britain to ask the exiles to return and rebuild the country. The generals who governed Myanmar never did so, to their country’s enduring cost. But Uganda’s loss was Britain’s gain. 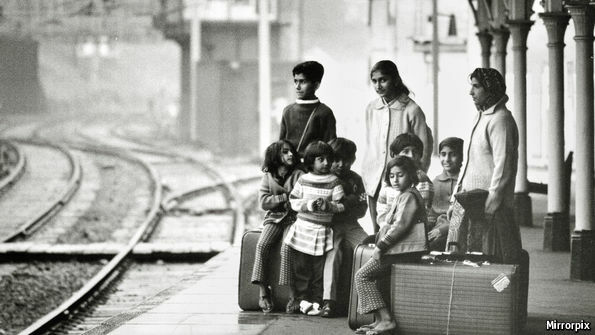 Stripped of most of their money and possessions by Amin, about 27,000 Indian refugees, mostly Gujaratis, arrived in Britain and set about building their fortunes a second time. Dolar Popat arrived in 1971 as a 17-year-old, slightly ahead of the main influx, with £10 ($24 at the time) in his pocket. He spent £6 of it on lodgings with an Irish family in Kilburn (the only people who would take a non-white tenant), got a job as a waiter in a Wimpy restaurant for 25p an hour and worked so well that his boss started to give jobs to other Gujaratis. By the time the bulk of the Ugandan Asians arrived, Mr Popat had bought a three-bedroom house in Wembley. He sheltered 25 of the refugees. 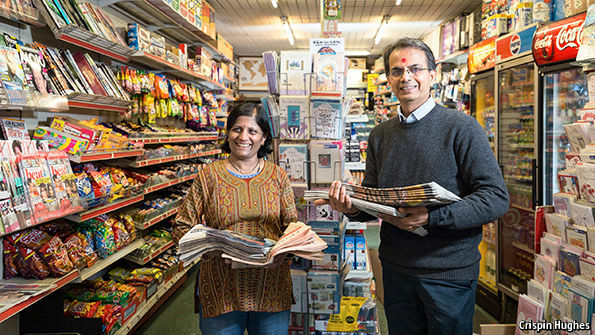 He took night courses in business studies, completed a part-time accountancy course and in 1977 bought his first corner-shop, with a sub-post office that gave him a fixed income. Three years later he set up a finance company providing mortgages (half of his customers were Gujarati), and soon after bought his first care home. Hotels and much else followed. Now worth about £70m, he was given a peerage by the Conservative government in 2010. “That’s how we fight prejudice and raise our living standards, through hard work, education and enterprise,” reflects Lord Popat today. Even the Conservatives, many of whom opposed the influx of Ugandan Asians, were eventually forced to acknowledge that the values of Gujaratis like Lord Popat were if anything more Thatcherite than their own. Norman Tebbit, a prominent minister in Margaret Thatcher’s governments, wrote to Lord Popat in 2012 that while he had opposed the Gujaratis’ arrival in 1972 he now acknowledged that they had “become integrated into the community and uphold British values and standards which have become rather less respected in some parts of our indigenous population”. Will Gujaratis around the globe continue to enjoy the same success in the future? The state their forebears came from has seen an uptick in sectarian violence between Hindus and Muslims in recent years, particularly in 2002, and this has, to an extent, damaged the religious and ethnic tolerance on which so much of their commercial ethos was built. There is a risk that divisions in India may, in time, spread to the diaspora. Some fear, too, that in the age of “knowledge economies” their utilitarian approach to learning might become a disadvantage; it is Bangalore and Hyderabad that have pulled ahead in India’s latest high-tech businesses. But, as the Gujaratis like to point out, they do the business, not the tech. As there have been gaps in the market during the past millennium, so there will be gaps during the next millennium—and Gujaratis will be there to exploit them.